Beyond marketing or digital identity, companies increasingly find the web as the way to enhance their productivity and services: decentralize management (back offices) or give the customers an online service are examples of it. Although the Web was not originally designed for a dynamic and bidirectional interaction, the emergence of new technologies and the improvements in modern browsers, allow us to design applications ever closer to traditional desktop applications. These web applications are different from web pages and web applications (e-commerce, for example) because their users need a more continuous, long and agile interaction with the system. For example, a call center user (customer service, technical service, collection management and others). Keyboard. It is essential that the application can be governed by the keyboard and not only by the mouse. Tab, enter, arrows and others keys. Performance. An appropriate speed is required not only for a good user experience but also for productivity matters. Security. These applications deal with very sensitive data. No blinking effect. Content loading must be partial and dynamic. Continuous refreshment of the whole page produces an uncomfortable and unhealthy effect. Nice and standard layout. Content must be clean and never overloaded (kitsch). SPA pattern (Single Page Application). The app is a single initial page where further content is loaded dynamically. It allows us to implement policies such as: initial loading of files (js, css, images, etc), shared session control, increase processing on the client, etc..
Standard layout across the whole application. The screens, buttons, tabs, data grids and other controls should have a common look&feel. JavaScrtipt Framework. 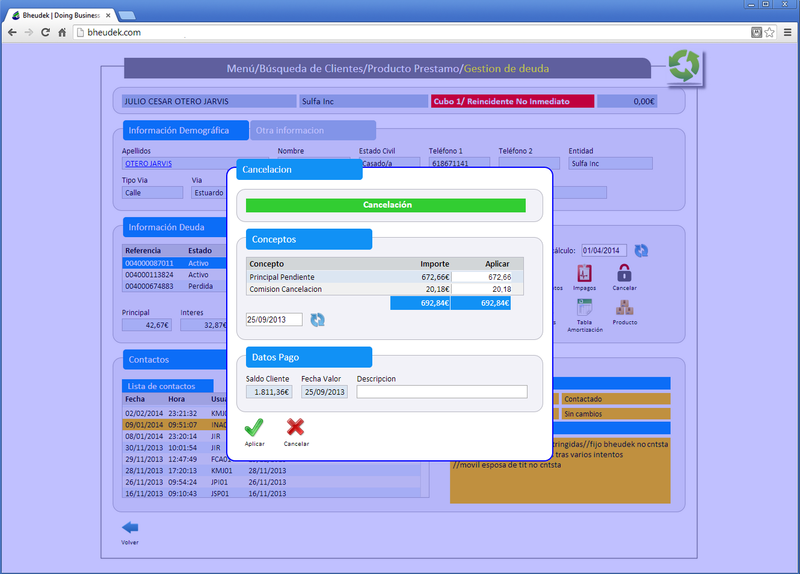 Required to standardize the interface and provide it with the services to manage controls and windows. For security and adaptability reasons, the best choice for a framework is in-house development and single-object encapsulation. Handle keyboard events. The framework must provide this feature. Minimize network traffic. Data transferred from the server should be as few as possible, even if it means more processing on the client side. Standards as JSON are recommended. Modal windows. They improve the user experience and the application dynamism. Use sprite images. Load all images on a single connection. A UI automated development and a powerful js framework is the best way to achieve these goals. Whenever we deal with desktop applications, we must meet some strict requirements, as they are tools in which users will spend much of their time. New devices may appear and also new ways to interact with systems, but when it comes to interaction, traditional requirements as keyboard, performance, safety and user experience are a must have. Posted on July 24, 2014, in Academic, bheudek and tagged Academic, Desktop Apps, Web. Bookmark the permalink. 1 Comment.